Zhytomyr (also known as Zhitomir) city is the capital of Zhytomyr region, central Ukraine, on the Teteriv River, a tributary of the Dnieper. It is a road and rail junction in an agricultural area. Industries include lumber milling, food processing, granite quarrying, metalworking, and the manufacture of musical instruments. 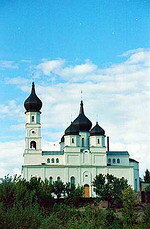 An old city on the trade route from Scandinavia to Constantinople, Zhytomyr was known in 1240. It was part of Kievan Rus and later passed to Lithuania (1320) and Poland (1569). Awarded to Russia in the second partition of Poland (1793), it became an important provincial and trade center before the Bolshevik Revolution. districts, 9 cities and towns. 56% of the oblast's population is urban. 85% of the population are Ukrainians. The region's potential of minerals and raw materials is represented by 278 deposits with 20 kinds of minerals. The mining industry here is extracting titanium ores, Dinas quarzites, and building and facing stones. The region embodies one fifth of the country's reserve of rubble and crushed stone processed by a number of powerful companies. Decorative and facing stones - labradorite, granite, gabbro - are found in unlimited quantities. Development of the deposit of easily polished marble with a marvelous pattern and extraction of semiprecious stones - beryl, topaz, quartz - are under way. Piezoelectric quartz crystal, a widely used component of any electronic device, is also available in this area. There are also deposits of high quality pyrophyllite. The oblast is interested in mobilising investments and finding partners for pyrophyllite extraction and development. Among other deposits requiring funding by investors, there is a unique quartzite deposit. It contains about 84% of the country's quartzite reserves. These raw materials are used for lining blast furnaces and preparation of ferroalloys.